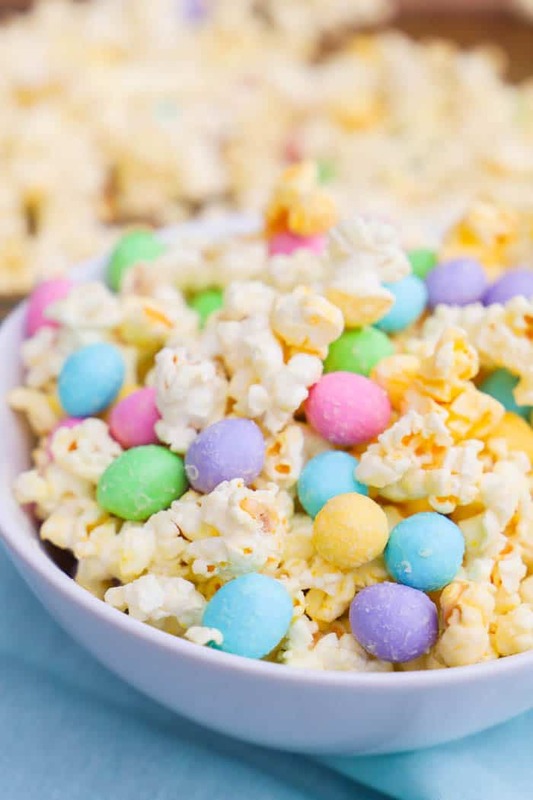 All you need is three simple ingredients to make this White Chocolate Easter Popcorn. It’s the perfect treat for your Easter celebrations. We love movie nights in our family. It’s a fun way to spend time together and of course, every movie night is equipped with snacks. 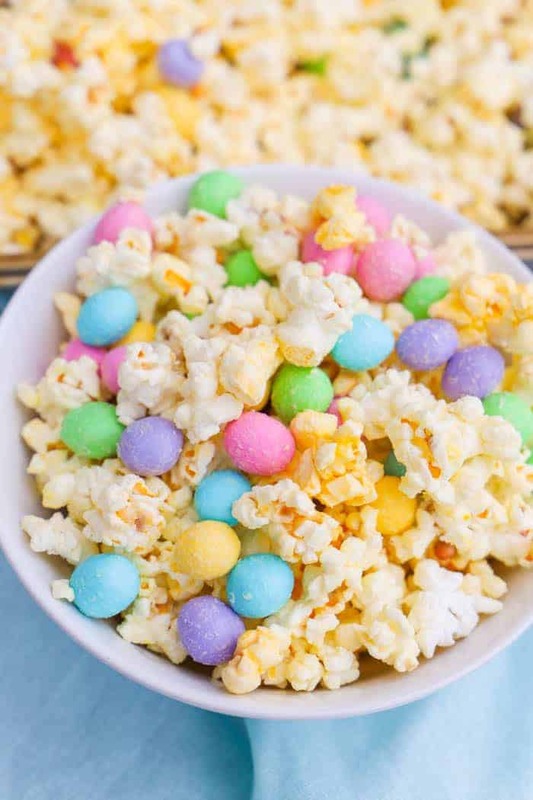 This Easter season we have a few family nights planned and this White Chocolate Easter Popcorn will be on the menu. It’s simple to make and one that the entire family will enjoy. Step one: Start by preparing your popcorn. Place popped popcorn into a large mixing bowl. Step two: Melt white chocolate in a double boiler. Melting white chocolate can be tricky so I suggest using a higher quality white chocolate and one that is made for baking. Carefully pour melted white chocolate over popcorn and gently mix with a spoon until popcorn is coated. Step three: Add peanut M&M’s and toss. Lay popcorn on a baking sheet to cool. 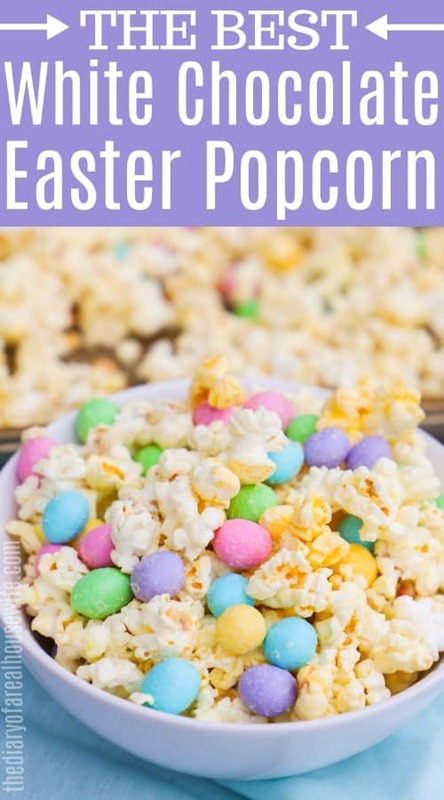 You can use your favorite popcorn for this recipe. Pop your own or grab a pre-popped bag. I suggest using one with less butter and defiantly no cheese flavor. Something lightly salted will work perfectly. 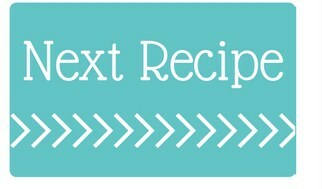 For this recipe, you can add any of your favorite Easter candy. I loved M&M’s in my popcorn and I thought the peanut M&M’s looked liked Easter eggs. Place popped popcorn into a large mixing bowl. Melt white chocolate in a double boiler. Carefully pour melted white chocolate over popcorn and gently mix with a spoon until popcorn is coated. Add peanut M&Ms and toss. Lay popcorn on a baking sheet to cool. What’s not to love about this? Popcorn, chocolate, and m&ms?! Seriously. Sugar rush! Gaaaah, I need this in my life. Wow, this popcorn looks so yummy! I love popcorn and with chocolate and m&m’s how can you go wrong.